UTM Perdana School is committed in training as professionals to incorporate problem solving skills and knowledge to improve the quality of policy development and implementation in science, technology and innovation. This program will be conducted at Razak Faculty of Technology and Informatics, Universiti Teknologi Malaysia, Kuala Lumpur. The program requires a nominal duration of three semesters (1 1/2 years). The progress of the student is assessed each semester through a progress report. The degree is awarded based on a comprehensive examination (viva voce) of the doctoral thesis submitted by the student at end of study. All Master of Philosophy research are supervised by academic staffs from the Graduate Faculty member. 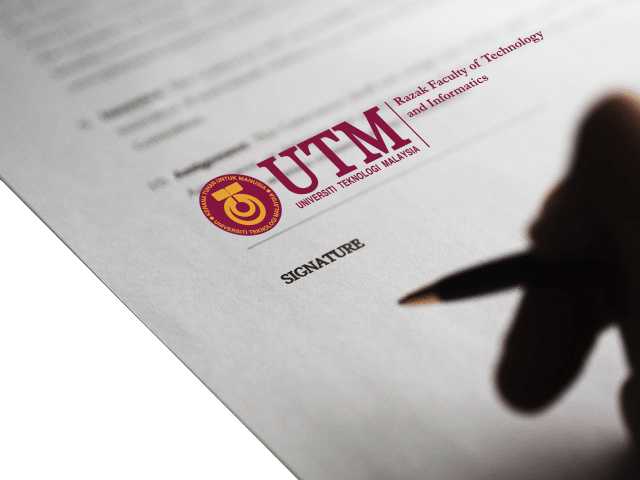 Bachelor’s degree in any field of study or a related discipline from Universiti Teknologi Malaysia or any other institutions of higher learning recognized by the UTM Senate.